It’s a great day for hockey. And I’m not just saying that because I love the Penguins tagline. It’s a great day for hockey because I feel like playoff hockey is within reach. The season is coming to a close, teams are leaving it all out on the ice and my team is looking like a top contender for the Cup. Not to mention that Sidney Crosby is back. Sidney Crosby back on the ice and making an impact. Photo by Getty Images. Regardless of whether you’re a fan or not, you have to appreciate what it means to have him back in the game. The entire league benefits from having the best player in the world back on the ice. Stay tuned for the latest and greatest hockey news. It’s only going to get better and better the closer we get the playoffs. This entry was posted in For the Good of the League, National Hockey League, Pittsburgh Penguins and tagged NHL, Pittsburgh Penguins, Sidney Crosby. Bookmark the permalink. 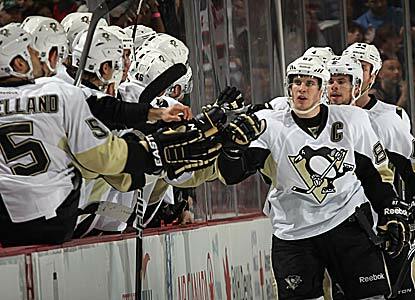 ← The Pittsburgh Penguins broke my heart.